Half-day, one-day and two-day workshops are offered. These may be expanded and/or combined for a stimulating 3-5 day retreat. 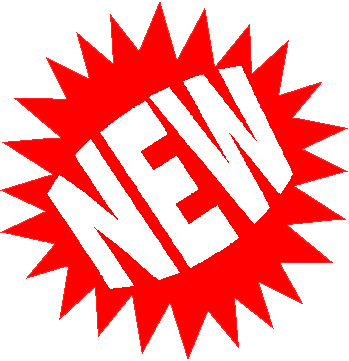 Half-day workshops last for 3 instructional hours. Full-day workshops last for 6 instructional hours. The maximum number of workshop participants is 20, unless special arrangements are made. Please click here for fees and details. 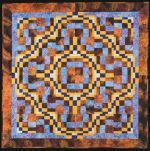 The Bargello 16-piece block, as featured in my book Bargello Quilts with a Twist, provides enormous potential for creating original designs. If you've felt intimidated by the Bargello technique of sewing numerous strips together, never fear. 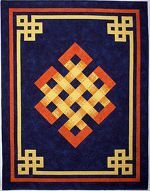 The Ölzii, or never-ending knot, is a traditional Mongolian motif symbolizing the dynamic expanse of the universe and the endless cycles of life and death. It brings long life and prosperity, and drives away wild beasts and evil spirits. 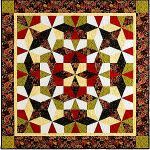 A new template-free method for cutting and piecing Kaleidoscope blocks. It is easy and fast and does not require triangular rulers. The design possibilities are numerous and are fun to explore. Introducing the new Op-Art Kaleidoscope block. 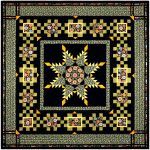 Make a minimum of four large template-free Kaleidoscope blocks using only two fabrics and then slice and switch to create four 14” Op-art Kaleidoscope blocks. This quilt, made from sixteen Op-Art Kaleidoscope blocks, is surprisingly easy to construct using my method with no wedge-shaped templates or triangular rulers. Students are encouraged to experiment and explore some of the many options to generate their own unique quilts. The Octangle block is an octagon surrounded by triangles. The central octagon is perfect for highlighting attractive large prints. Make five blocks for a table runner, or more for a larger quilt. Make the beautiful 28½” Radiant Star block with your choice of a Snowball or Kaleidoscope in the center. We will study a variety of piecing techniques for perfect triangles, including foundation paper-piecing for the feathers. 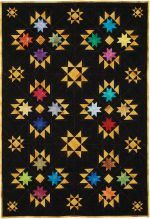 This charming crib quilt or wall hanging features Sawtooth Star Bear’s Paw blocks set with three sizes of Ohio Stars. Choose a variety of colors and make your stars shine out like gems. You will learn to piece a variety of new blocks derived from the traditional Bear’s Paw pattern, all featured in my book, Traditional Quilts with a Twist. Pick out your favorites to make this attractive large lap six-block Bear’s Paw quilt. For those who enjoy instant gratification with an element of surprise, these pinwheels will delight, excite, and may become addictive. Inspired by Bethany Reynold’s Magic Stack ‘N Whack, I have devised a technique for making pinwheels that float on the background. Learn to use the critical elements of design to your advantage, from choosing fabrics to completing successful quilts. 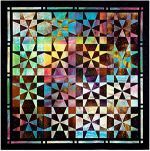 Take the mystery out of color and understand how to use value, scale and appropriate proportions to enhance the design of your quilt. Simple exercises and a trunk show of a variety of quilts teach you to make intelligent choices enabling you to create original and exceptional quilts. No sewing in this class. Learn the basics of successfully drafting patterns for any sized block. Simple exercises on graph paper walk you through a methodical approach, ensuring accurate measurements for the cutting sizes of block components. 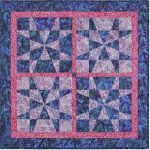 Receive guidance about planning your quilts to use efficient piecing techniques, and to calculate the fabric requirements for each component. No sewing in this class. 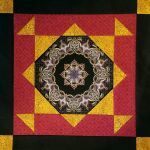 Trunk show and instruction provided for exploring a variety of settings for quilt blocks and choosing appropriate borders for your quilts. Bring your stack of quilt blocks or a partially made, problematic quilt that is begging for help. You'll be offered suggestions for solutions and benefit from multiple opinions. No sewing in this class.